Southern juniors Sean Myers (60) and Alex VanMeter (50) put pressure on Waterford quarterback Peyten Stephens (12) during the Wildcats’ 14-6 win on Friday in Racine, Ohio. RACINE, Ohio — The Wildcats’ Tri-Valley Conference Hocking Division is still intact, but by the closest margin to date. 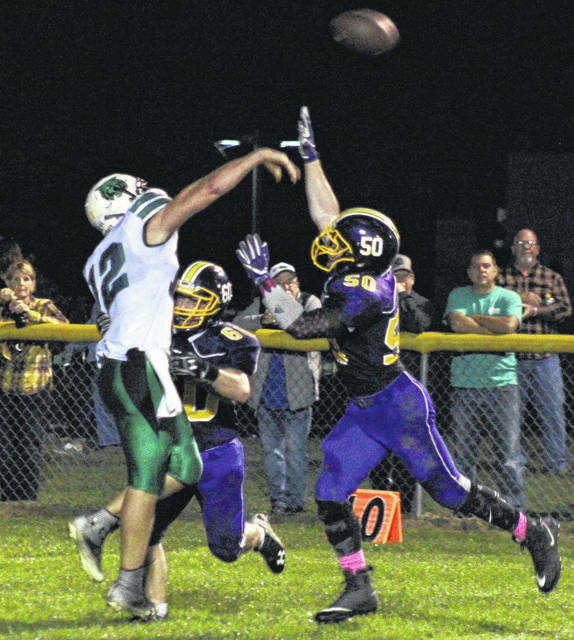 The Waterford football team earned its 14th straight league win on Friday night at Roger Lee Adams Memorial Field in Meigs County, defeating host Southern by a 14-6 margin, despite the Tornadoes outgaining the Wildcats in the contest. After a punt by each team on the first two possessions of the game, Waterford (7-1, 6-0 TVC Hocking) — which had won all other games in its 14-game league winning streak by double digits — took over at its own 15-yard line. The Wildcats ran 6:53 off of the clock before Peyten Stephens tossed a four-yard scoring pass to Rhys Thatcher, giving the guests a 6-0 lead with 1:46 left in the opening quarter. WHS needed 15 plays to cover the 85 yards, converting two third downs and two fourth downs on the drive. After a loss of downs and a punt by each side, Southern (5-3, 3-3) offense began at its own 23-yard line with just 4:26 left in the first half. The Tornadoes converted on a pair of third downs, moving the ball into Waterford territory with just over two minutes left in the half. With just 49 seconds until halftime, the Tornadoes evened the score with a 14-yard touchdown run by Riley Roush. The scoring run was Roush’s eighth carry of the drive and his longest run of the night. Southern’s point-after kick missed, leaving the teams tied at six headed into the break. The Tornadoes and Wildcats both punted on their first two drives of the second half, with Waterford earning the only first down over those four possessions. Southern began its most successful drive of the second half at its own 13-yard line with 7:01 left in the third quarter. The Purple and Gold covered 78 yards in 6:06, but ultimately fell three yards short of a first down, giving the ball to Waterford at its own nine. The Wildcats combined 47 yards on seven run plays, 29 yards on one pass and 15 yards on a Tornado personal foul to cover the 89 yards, with Stephens delivering the go-ahead score with a 10-yard touchdown run. Braden Bellville ran in the two-point conversion, giving the guests a 14-6 edge with 9:20 remaining. On the ensuing drive, Southern made it down to the WHS 25-yard line with six minutes left, but two backwards runs and two incomplete passes gave the ball back to Waterford. The Tornado defense came up with the three-and-out it needed to get the ball back with 2:30 left in the game. Southern took possession at its own 45 and gained one first down before Bellville intercepted a Tornado pass. Waterford got the one first down it needed to be able to run out the clock and seal the 14-6 victory. For the game, Southern outgained the Wildcats by a 244-to-220 clip in total offense, with a 197-to-149 edge on the ground. The hosts also earned a 14-to-12 advantage in first downs. Both teams were penalized seven times, SHS for 55 yards and WHS for 45 yards. The interception by Bellville was the only takeaway in the game, even though the Tornadoes fumbled three times and the Wildcats fumbled twice. The Tornadoes had an average starting position of the Waterford 31-yard line for its nine drives, six yards farther back than Waterford averaged. WHS started two of its 10 drives in Tornado territory. “When you play a good football team, those little things like penalties and field position become big things,” Chancey said. “If you’re going to be beat a team like this, you can’t make even those small mistakes. I don’t think we had a lot of mistakes, but the ones we did have hurt us and stopped some drives. “We have two weeks of football left and we’re going to do everything we can to finish this the right way,” Chancey added. 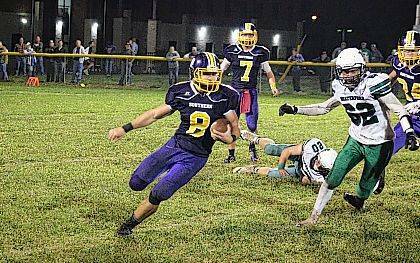 Roush led the Tornado offense with 127 yards and one touchdown on 30 carries. Dylan Smith was next with 60 yards on 11 carries to go with 17 yards on one reception. SHS junior Logan Drummer — who ran three times for a total of 10 yards — was 3-of-12 passing for 47 yards, with Gage Shuler as the team’s top receiver, hauling in two passes for 30 yards. Roush also led the Purple and Gold on defense with 3.5 tackles for a loss, followed by Austin Arnold with 1.5 tackles for a loss. Bellville led the WHS offense 96 total yards, combining 19 carries and one reception. Stephens posted 39 yards and a touchdown on six carries, to go with 9-of-20 passing for 53 yards and one score. Zane Heiss ran twice for a total of nine yards, while completing his only pass attempt for 29 yards. Andrew Harra-Baker led Waterford’s receiving unit with 30 yards on three receptions, Thatcher added 33 yards and one score on two receptions, while Noah Huffman and Alex Hinton earned 14 and nine yards respectively on two catches each. The Wildcats have now defeated Southern in four straight meetings. Southern returns to the road next Friday, visiting 2-6 South Gallia. 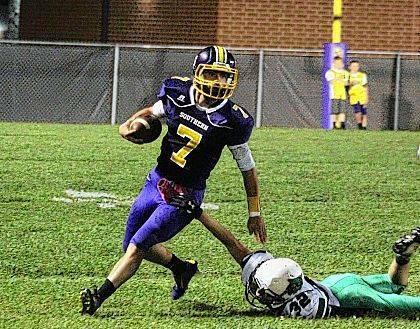 Waterford will be home on Friday against winless Federal Hocking.